Nathan and Benjamin's affections for various toys have waxed and waned through the years. The passion they once held for Hot Wheels and Thomas the Tank Engine wooden trains has burned out, leaving indifference at best. The one toy that they have consistently played with and continue to obsess about? 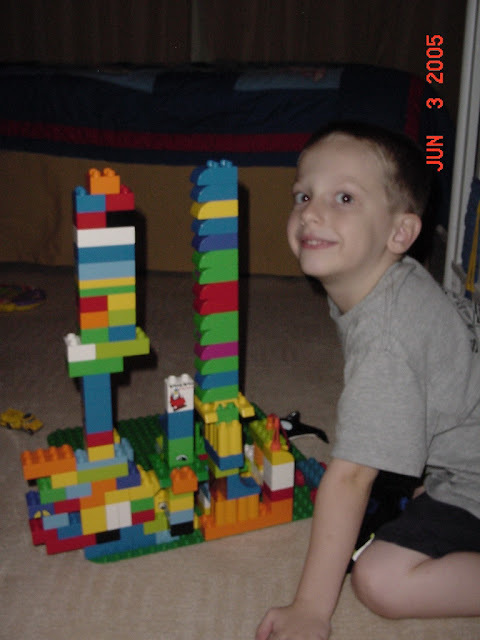 Those brightly colored plastic bricks made by LEGO. They had the big Duplo sets as toddlers, and though I've tried to pass their collection along to families with kids younger than mine, they refuse to let them go. 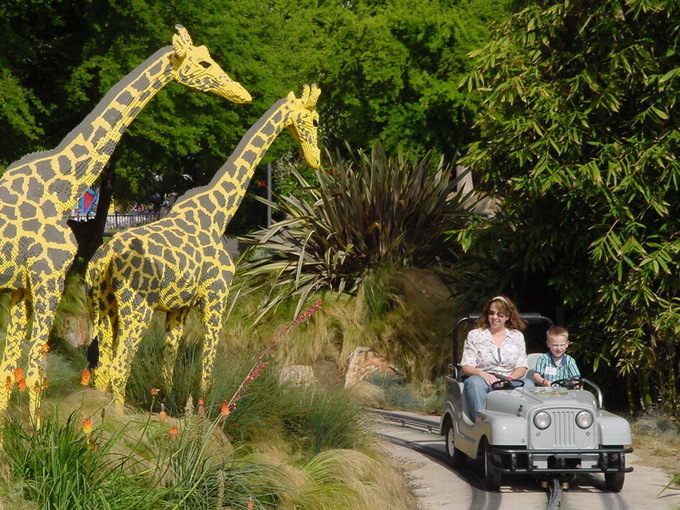 ﻿﻿But because of the many play areas filled with buckets of LEGO Bricks to play with! Benjamin, age 10 months, a young but passionate fan of LEGO! When Nathan was four he got his first bucket of the smaller bricks which he played with constantly. I'd scour garage sales and pick up random sets (which I'd wash in the sink with bleach diluted in water) to add to the collection. As birthdays came, there were specific sets that they started asking for, mainly Star Wars themed. Last year my little brother spontaneously gifted them with his own LEGO collection... a lifetime worth of now-vintage sets. They have thousands of bricks. And unlike other toys, they actually take very good care of them. We somehow got on the LEGO mailing list, and now the boys receive quarterly catalogs which they pour over nearly every day until the staples give out and the pages disintegrate. When the Spring catalog arrived, they jumped on the couch and buried their heads in the photos and descriptions. And then suddenly, Nathan started shouting, "What?!? They made a mistake! Oh no! There is a mistake! Right here!" Sure enough, there was a page with several typos. Nathan was indignant, and rushed over to turn on the computer. He opened up a new document and starting typing a letter of complaint, expressing his shock that this holy catalog should have a mistake in it. He pointed out the errors and what it should have said. I was quite surprised that he was motivated to this action, but went along with it. I added the address of the company and our return address, leaving it otherwise in his own words. He signed it, "Nathan Chase, age 10." 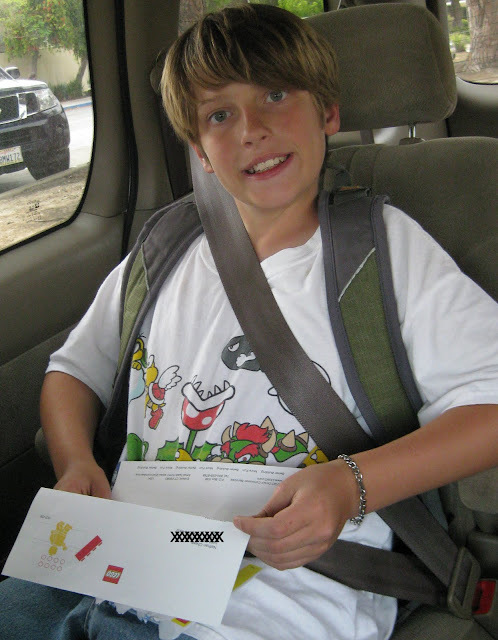 We mailed it off the next day, and each day after school Nathan would ask to see the mail, checking for a response. The boys daydreamed incessantly that LEGO would be so grateful about Nathan showing them their error that they would send hundreds of dollars in bricks, or at least a mini fig. About the time he stopped asking, a letter came in the mail, addressed to Nathan. It took every ounce of will power for me not to tear into it! I brought it with me when I picked up the boys, and had Nathan open it the second we got in the car. Nathan read it out loud, very slowly. It was not a form letter. It was a letter written by a real person, praising Nathan for his incredible eagle eyes and his attention to detail, and expressing gratitude for taking the time to write them such a great letter. They said they would work harder to make sure they didn't make the same mistake again. The letter asked﻿ him what his favorite collection was, and told him that they would love to hear from him again, any time. It was signed "Your LEGO friend, Dana," with an actual signature, in ink. After he finished reading it, he just sat staring at it, expressionless. Ben shared his disappointment that it didn't contain a set of bricks, but Nathan said nothing. Finally I asked him what he was thinking. He said he didn't know what to say. He said he was in awe. That he couldn't believe they wrote him a letter. 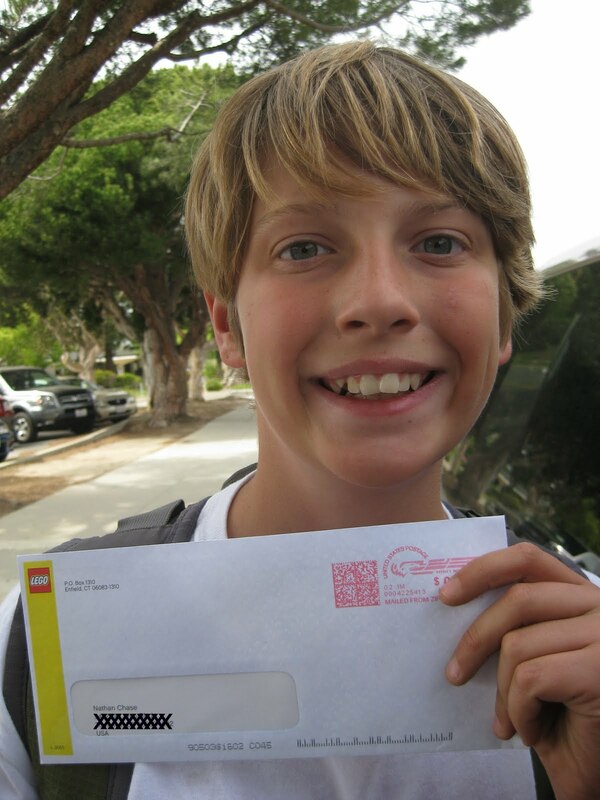 A real letter, addressed to him, on real LEGO paper, from a real person. He finally cracked a smile and said the letter was his favorite thing, ever, ever, EVER. This week when I changed the boys' sheets, I decided to flip their mattresses. When I flipped Nathan's, I found the letter, tucked back into its envelope, stashed between the mattress and the bed frame. It was quite worn, with plenty of smudges, the folds starting to wear thin. In the two months since he received it, it's obviously been read and re-read over and over again, truly something that he treasures. Thank you, LEGO, for taking the time to write a 10 year boy, and for gracefully praising him when he pointed out your mistakes. I will forever be a fan of your product, your company, and Dana with-no-last-name, Nathan's LEGO friend. You rock.